Welcome, mes amies, to l’Acadiane! Pass a good time in Acadiana on this alphabetical tour of Cajun country and culture. The sights, sounds, and smells of all things Cajun two-step off the page as readers are introduced to the ABCs of the unique customs of the Cajun people. From the alligators in the bayou to the stars of the zydeco stage, the food, music, literature, and language unique to the people of southern Louisiana are delightfully rhymed and beautifully illustrated. This lively yet educational jaunt showcases the famous Cajun joie de vivre and sets the stage for the reader’s own Acadian adventures. With a heritage firmly rooted in the bayous and marshes of Louisiana for more than 240 years, the Cajun people have established a way of life that reflects triumph over struggle. Author Rickey Pittman and illustrator Alexis Braud honor the proud history that has turned life into a celebration, from the fanfare of a holiday bonfire on the levee or the joy of a fais-do-do to the simple pleasure of a shared family meal. Detailed illustrations capture in spirited authenticity the tradition of the courir de Mardi Gras, highlight in vivid brushstrokes the beauty of Acadiana’s famous landmarks and landscapes, and showcase the legendary characters who call south Louisiana their home. 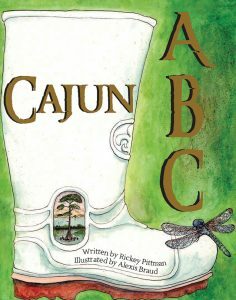 From the smallest details of daily life to the fantastical fifolet of Cajun folklore, the spirit and the spice of Cajun country infuse these pages. A glossary of terms completes this beautiful primer to a unique way of life.